Very few early-flowering bulbous, tuberous and cormous plants are so massively planted as the Crocus. Together with tulips, hyacinths and narcissi, these plants are the most commonly found 'bulb' plants in gardens and parks. More than 100 species are known, but only thirty have been cultivated. 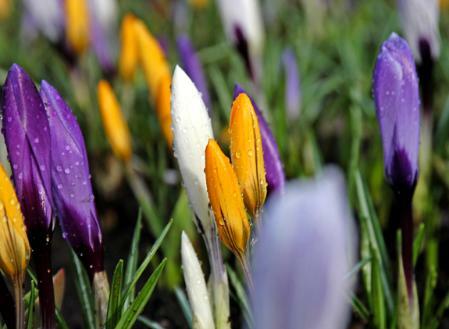 The most popular crocuses are the ones that no longer closely resemble their wild ancestors. Some crocuses flower in the fall, but these are fairly rare. Crocuses are very similar in appearance to the Colchicum, to which they are distantly related. The Crocus can be distinguished from the Colchicum by the number of stamens: the Crocus has three, while the Colchicum has six. Many crocus species come from countries bordering the Mediterranean. The effect of crocuses is especially beautiful when they are planted in large numbers. For a massive effect, 100 to 150 corms should be planted. One important growing condition is that crocuses must have a well-drained soil. Crocus bulbs remaining in the ground will always bloom a bit earlier than the ones planted the previous year. The calyx-shaped flowers open only when the sun shines or when there is a lot of light; they close up in rainy weather and at night. Crocuses are lovely in lawns as well as in the perennial border where they join the other very early perennials in ringing in the flowering season. Crocuses have narrow leaves with a silver-grey stripe down the middle. The plant’s scientific name is a Latin name derived from the Greek word, krokos. With this name, the ancient Greeks were most likely indicating the plant used as a source of saffron and which we now call Crocus sativus. Dutch crocuses are also sold in mixed colours. Crocuses are indispensable for each and every garden. They join snowdrops, winter aconites and glory-of-the-snow as the very first heralds of spring. The bright yellow ones so often seen bring the first bit of ’warmth’ to the new year. One familiar use for crocuses is in the lawn. Here, one should try to achieve as natural-looking effect as possible. This can be done, not by grouping the corms together, but by scattering them about and then planting them where they fall. Use larger numbers for a massive effect: 125-150 corms to every square metre. Although it is possible to use all colours of crocuses for this purpose, the blue and purple ones are the least conspicuous. Yellow is extremely popular, but mixing crocuses is also frequently done. Good proportions to use for a mix of large-flowering varieties are: 50% blue and purple, 25% yellow, 15% white and 10% striped. C. chrysanthus cultivars are also planted in lawns, and C. tommasinianus is another natural choice for planting in the grass. Planting crocuses in lawns, however, will require some adjustments to the mowing regime. To be assured of a profuse flowering next year, the lawn should not be cut until six weeks following the crocus’ flowering period. Any and all crocuses make a pretty sight in the perennial plant border. Far before any of the vast majority of the perennial plants, the crocuses will be busy cheering up the garden. The smaller crocuses can be combined with many early perennial plants such as Pulmonaria (Lungwort), Helleborus (Christmas rose), Hepatica , Primula (Primrose) and Pulsatilla (Pasque flower). Species with few leaves and small flowers such as Crocus minimus are appropriate for the rock garden. Crocuses can naturalise easily under shrubs and in areas where trees are not densely planted. Planting beds of them is a bit outdated but a very good effect can be achieved when combining them with early narcissi or small-flowered tulips. Because of their lack of foliage mass and early flowering, crocuses are very suitable for planting on top of other bulbous plants. Afterward, such bulbous plants as hyacinths, tulips and narcissi can easily take over the flowering duties from the early-flowering crocuses. The layering method is simple. First plant the larger bulbs and cover them with soil up to the level of their noses. Then plant the crocuses on top, being sure to plant a generous amount of them. This will produce a lovely effect and can be applied both in the garden soil as well as in containers. The winter hardiness of most crocuses make their use in containers quite possible. The large yellow crocus, however, is somewhat susceptible to frost damage. One drawback, of course, is that crocuses fade quickly. This means that a container filled with crocuses alone will not remain attractive long. Planting crocuses with other bulbous plants, especially those that flower somewhat later, is a better solution (also see question 21). A lovely combination can be made by using crocuses with late-flowering cultivars of Erica carnea, e.g., ’Myretoun Ruby’ (wine-red), ’Vivellii’ (purple-red), ’Snow Queen’ (white), and ’King George’ (purple-pink). Originally, saffron was obtained by drying the stigmas of Crocus sativus over an open fire. Saffron has been mentioned since ancient times, e.g., in ancient Egypt and in the Bible, often being said to be an extremely valuable medicine and dye. The dye still plays a role in marriage ceremonies in India. It has long been a very costly material, even being used as a medium of exchange. During the first half of this century, Spain was producing 50,000 kilograms of saffron annually. You can imagine how many crocus flowers were needed to produce this much by knowing that it takes the pistils of 150,000 crocus flower to produce 1 kilogram of saffron! C. sativus, its species name meaning ’very good to use’, belongs to the autumn-flowering species.